Join us for a year of exciting events hosted at Tucker House Renewal Centre! 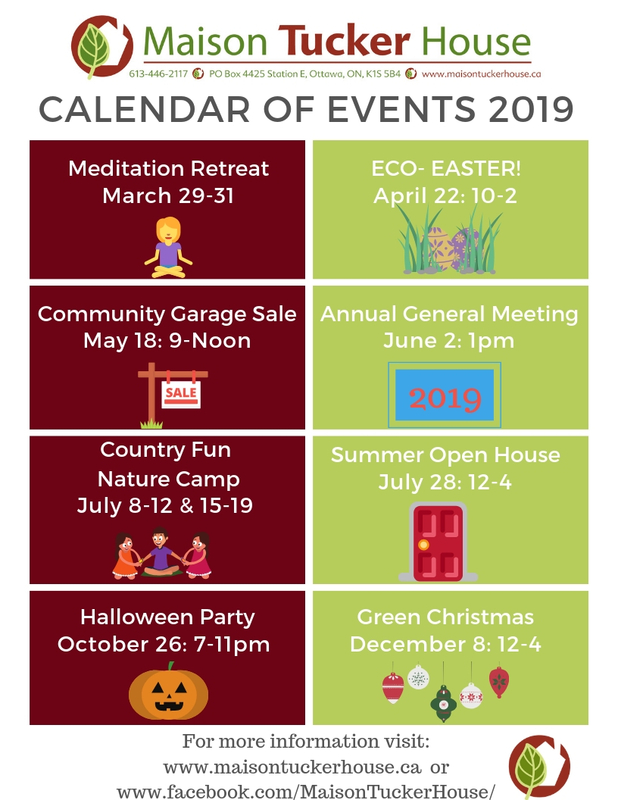 See our calendar of events below and stay tuned for more details on upcoming events with us. As always, get in touch if you would like more information or you are interested in volunteering! Details for Eco-Easter + Community Garage Sale are available now! On Easter Monday join us at Tucker House for a fun day with activities including: Easter Egg Hunt, Natural Egg Dyeing, Earth Day, Tea Room, House tours and more! All activities are by donation and all are welcome! We will have 2 different Easter Egg Hunts! The first for the little ones 5 and under close to the house and easy to spot locations and the second intermediate level for bigger kids through the forest trail with staff and volunteers. There will be a backup plan for an indoor egg hunt if the weather doesn’t hold up. Inside the house we will have fresh boiled eggs and natural colors to dye and to take home + a coloring station for kids! There will also be a tea room in the parlour with tea and snacks to enjoy. Why not take a tour of the house or the estate while you are here? Or learn about our upcoming programs like our community garage sale, Country Fun Nature Camp and summer open house! So many activities to keep the entire family busy on the holiday Monday and all activities are by donation to support the cost of the activities and towards our summer camp. Spring cleaning time! Join us and some of the neighbors for a garage sale like no other. We are cleaning out the Tucker closets and want to share with you! From books to plants to vintage items + house tours and information on Tucker House programs and a sneak peak at our new edible native plant arboretum, it is sure to be a fun spring day activity for all. All proceeds from sales go to environmental programming for kids and Country Fun Nature Camp! Book a table or donate items for us to sell!